Jorge Alberto Guajardo sits in the 398th state District Court during the sentencing phase of his trial for his involvement of the murder of Javier Olmedo, Friday, Dec. 22, 2017, at the Hidalgo County Courthouse in Edinburg. 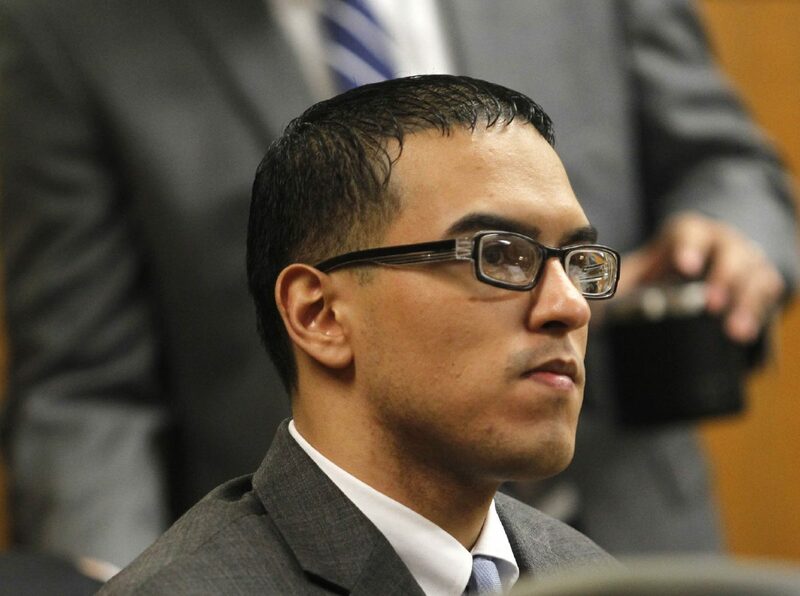 EDINBURG — Before a jury sentenced a young man convicted of manslaughter, aggravated assault and deadly conduct to 25 years in prison Friday, he asked jurors to consider rehabilitating him instead of punishing him. 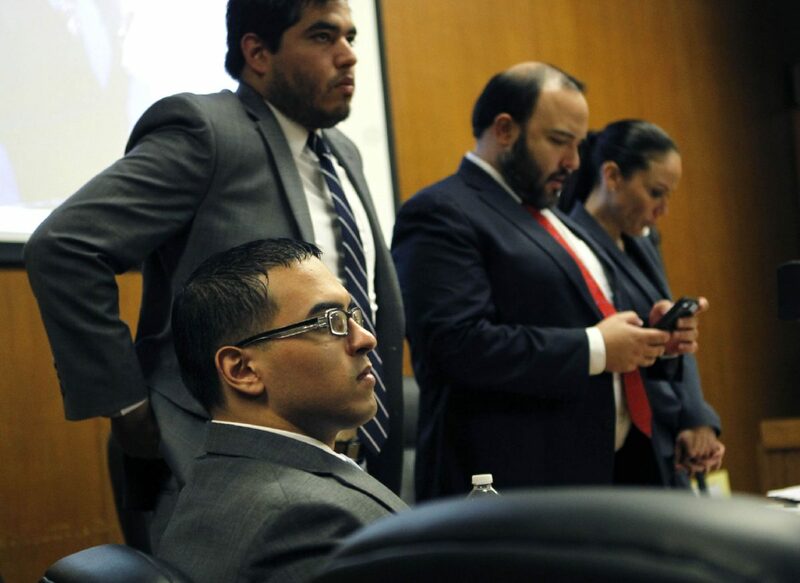 To make his case, Jorge Alberto Guajardo pulled from his previous experiences when he took the stand earlier in the day during the punishment phase of his trial. Though 25 years old, he’s already served a five-year prison sentence and has been in jail since his October 2015 arrest for the death of 17-year-old Javier Olmedo, who was shot to death Sept. 28, 2015, on Expressway 83 in Donna. Because of his previous felony conviction, Guajardo’s sentences were enhanced — instead of facing a maximum of 20 years, he faced up to 99. While on the stand, Guajardo admitted to driving the car that chased down Olmedo’s vehicle, which was carrying two other passengers, but did not broach whether he fired upon it, as the prosecution alleges. He simply said that his co-defendant, Rolando Rene Rodriguez, had threatened him to drive. Rodriguez pleaded guilty to murder last January — when Guajardo was expected to do the same before withdrawing his plea — and sentenced to 35 years in prison. Rodriguez was called to the witness stand various times during Guajardo’s trial and maintained both of them had fired at Olmedo’s car. Olmedo and his passengers were members of the South Side Bandidos, a rival gang. In question throughout the three-week trial was whether Guajardo was a member of the Tri-City Bombers, the gang to which witnesses testified Rodriguez still belongs, despite the 23-year-old testifying that he wants out. A gang intelligence officer at the Hidalgo County jail testified Friday that although Guajardo admitted to being affiliated with the gang in question when he was booked for Olmedo’s death, two months later he informed jail staff he no longer wanted to be a member. The officer said she considered him an ex-gang member. In his closing argument, defense attorney Christopher Sully said his client’s difficult childhood — in which he was physically abused by a stepfather and spent time in foster care — had initially drawn him to the gang. While the defense cast their client as a misguided young man who surrounded himself with the wrong crowd, the prosecution painted him as a hardened criminal who refused to accept responsibility for his actions. Assistant District Attorney Michelle Puig reminded Guajardo that she was his prosecutor when he plead guilty to aggravated robbery in 2010. “When you were in prison, you didn’t learn anything, did you?” Puig asked, emphasizing that he shot Olmedo only a few months after being released on parole. When she asked whether he considered prison a punishment, Guajardo responded that he did, but added, “I don’t think it’s a place to try to help somebody either though,” to which the prosecutor replied that prison was a place for those who can’t be helped. Both Puig and her co-counsel, Assistant District Attorney Vance Gonzales, described him as a danger to the community. Before learning his sentence, Guajardo told jurors he dreamed of opening a barbershop and tattoo parlor upon his release from prison and hoped to start a family of his own. He may be eligible for a parole review after serving half of the 25-year sentence. Guajardo’s younger sister, who described her oldest sibling as “a good person with a big heart,” told him she would continue to support him and his plans no matter the sentence.